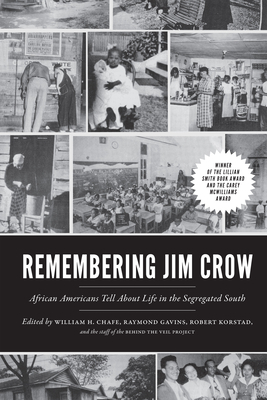 Praised as "viscerally powerful" (Publishers Weekly), this remarkable work of oral history captures the searing experience of the Jim Crow years--enriched by memories of individual, family, and community triumphs and tragedies. In vivid, compelling accounts, men and women from all walks of life tell how their day-to-day lives were subjected to profound and unrelenting racial oppression. At the same time, Remembering Jim Crow is a testament to how black Southerners fought back against the system--raising children, building churches and schools, running businesses, and struggling for respect in a society that denied them the most basic rights. The result is a powerful story of individual and community survival and an important part of the American past that is crucial for us to remember. Based on interviews collected by the Behind the Veil Project at Duke University's Center for Documentary Studies, this landmark in African American oral history is now available in an affordable paperback edition and, for the first time, as an e-book with audio of the interviewees--in their own voices. William H. Chafe, project director of Behind the Veil, is a professor emeritus of history and the Alice Mary Baldwin Professor of History emeritus at Duke University's Sanford School of Public Policy and the author of multiple books. Raymond Gavins is a professor of history at Duke University and the project director of "Behind the Veil: Documenting African American Life in the Jim Crow South," an oral history project undertaken by Duke's Center for Documentary Studies and funded by the National Endowment for the Humanities. He is the author of The Perils and Prospects of Southern Black Leadership. Robert Korstad is the Kevin D. Gorter Professor of Public Policy and History at Duke University. He received his BA and PhD from the University of North Carolina at Chapel Hill. His research interests include twentieth-century U.S. history, labor history, African American history, and contemporary social policy, and he is the co-director of a major documentary research project at Duke's Center for Documentary Studies, "Behind the Veil: Documenting African American Life in the Jim Crow South." Chafe, Gavins, and Korstad live in Durham, North Carolina.